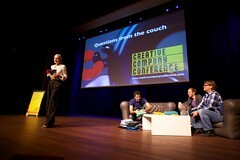 September 14th 2010 was the day for the 4th edition of the Creative Company Conference (photos). The speakers at conference turned out to be a very diverse mix of creatives. It was a ride that took the audience from design thinking to transmedia storytelling and everything in between. The goal of the organization was to make this years conference more interactive then the previous editions. They for instances introduces “Questions from the Couch” which where very loosely formed panels. Another interactive break from the regular program where four workshops by members form the Dutch Service Design Network. Our workshop was titled “Service Thinking in Practice”. The workshop was spilt in 2 parts. In the first part I talked about the main ideas behind service thinking; people, experiences, stages and timelines. The second part was made up of an exercise in which the audience had to reframe the value of an existing offering.